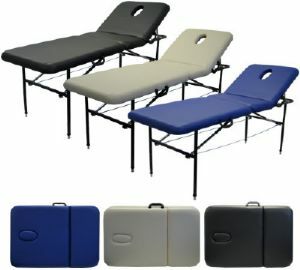 Sports Massage Tables - Auspedic AP-1015 includes Carry Bag. The Auspedic AP-1015 Massage Table incorporates the simple design of the AP-1010 with the addition of an elevating backrest. Includes free Carry Bag. With the elevating backrest, this table has proven to be very popular with therapists and beauticians who need their client sitting up at times. This table has been priced extremely well to bring it into the budget of every student. With its solid metal construction this table has the strength to last for years. This table also has adjustable height (as demonstrated by the image on the right). The table can be setup and folded away in seconds for easy storage. When folded the single strong handle on top make for easy portability. To protect your table an Auspedic heavy duty carry bag (AP-B1) is included free of charge.